Declaring “winners and losers” in Super Bowl advertising is almost as popular a sport as American football, but the lack of accurate and comprehensive viewer engagement/ROI data makes it tough to choose. So who won the battle for attention in Super Bowl LIII? To find out, we interviewed Dan Calpin a partner based in Bain & Company’s Los Angeles office. He is an expert in the firm’s Media & Entertainment, Retail, Customer Strategy & Marketing and Digital practices. How do you rank the Ad winners for Super Bowl LIII? Bain decided to use artificial intelligence to find out. Research just released from Bain Media Lab powered by Hive ranks the brands that earned the most exposure across commercials, sponsorships, and earned media according to AI-enabled analysis. We used computer vision and artificial intelligence to place more than 1 billion tags of metadata on television content daily, identifying objects, including logos and product placements. 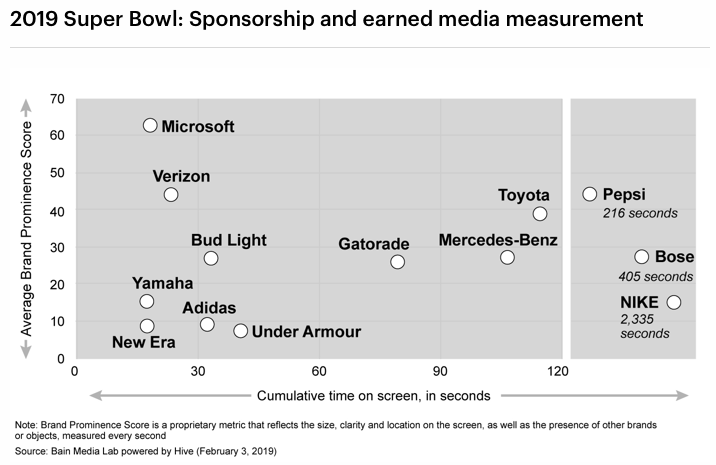 We measured the relative household viewership for each of the Super Bowl commercials as well as the cumulative quantity and quality of sponsorship placements during the game. We found that thirteen brands achieved more than 15 seconds of sponsorship visibility or earned media through logo and product placements embedded in the telecast; this exposure was led by official sponsors of the NFL and of CBS, which broadcast the game. O wow. Can you tell us what that means in terms of return on attention? Objectives of Super Bowl advertising vary. This year, Super Bowl ads drew awareness to new or recently launched brands, products and offers (for example, Disney’s Captain Marvel and Audi’s e-tron GT); they also built brand affinity through new messages (such as Budweiser announcing that its beer is now brewed with 100% renewable electricity from wind power). Measures of success are equally varied. Surveys and polls have long crowned winners by recall and favorability. In a multiscreen world, the metrics have expanded to include views, tweets, likes and shares. For the C-suite, however, the most meaningful measures are the outcomes that marketers hope these ads influence—namely, website traffic, store visits and ultimately sales. The lack of a definitive linkage between individual TV advertisements and outcomes, however, remains a barrier to a better understanding of the returns on these investments. The emergence of more advanced TV analytics solutions, however, provides marketers and media companies with an improved ability to link consumers’ TV advertisement and sponsorship exposure to their subsequent actions. 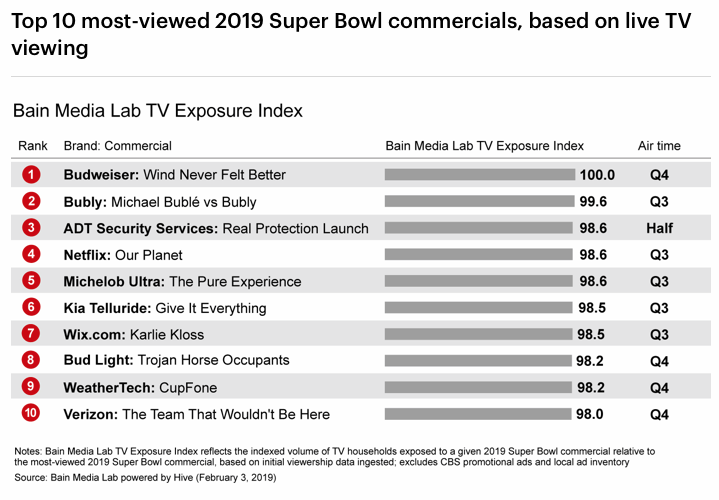 While business outcomes from this year’s Super Bowl ads will take time to assess, we already know which brands received the most exposure from TV’s biggest forum. So was there a clear winner? The Super Bowl tends to be less affected by these patterns, and this year was no exception. Viewership during this year’s game steadily ramped up and stabilized throughout the game. 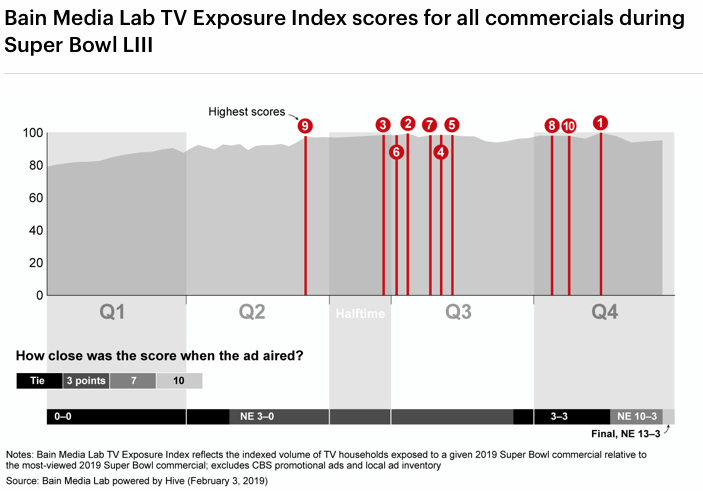 From the start of the second quarter through the end of the game, viewership of any individual commercial was within 10 percentage points of the most-viewed ad, and roughly half of all commercials were within 5 percentage points of the most-viewed ad. What can you tell us about sponsorships and earned media? Commercials get most of the fanfare, but the Super Bowl also provides similarly broad exposure for brands through sponsorships and, for those lucky or savvy enough, earned media. While there was no “Fiji water girl” stealing scenes and making headlines such as during last month’s Golden Globes, we saw a rich set of brand logos and product placements integrated into the telecast. Most of these were very deliberate, reflecting sponsorship deals worth tens or even hundreds of millions of dollars per year. As linear television viewing continues to erode, marketers and media companies alike have leaned into sponsorships and branded content as alternative means to reach audiences on television. The challenge has been how to measure and ascribe value to those placements accurately and efficiently. Bain Media Lab measures sponsorships and earned media via Hive’s proprietary content data set, which uses computer vision and artificial intelligence to place more than 1 billion tags of metadata on television content daily, identifying objects, including logos and product placements. To do this accurately, it is important to know not only how long a logo or product appears on screen but also how visible it is to the viewer. To that end, each logo or product placement also receives a Brand Prominence Score, reflecting the size, clarity and location on the screen, as well as the presence of other brands or objects on the screen. During this year’s Super Bowl, 13 brands achieved more than 15 seconds of cumulative screen time for their logos outside of commercial breaks; 9 brands received cumulative screen time that equaled or exceeded the length of a full 30-second commercial spot. The most and highest-quality logo and product placements were achieved by official sponsors of the NFL and of CBS, which broadcast the game. So now we still have to figure out if the advertisements and sponsorships resulted in increased business and improved brand equity… is this something Bain will be measuring? Measuring the impact of this year’s Super Bowl advertisements and sponsorships has just kicked off. Rest assured, the marketers who bet big will be tuned in. Which ad was your personal favorite?